After I wrote about one of my favorite birds last May, the Black-throated Sparrow, I received several reports of yards ‘full of’ these special birds. The Black-throated Sparrow is, in fact, seen in most SaddleBrooke yards, but most of the reported sightings probably were House Sparrows, our most common bird. Adult male House Sparrows can be confused with Black-throated Sparrows, since they also have a black throat, but otherwise the two birds are easily distinguished. House Sparrows are common to the point of being a nuisance, and tend to hang out in flocks of a dozen or more birds. They try to monopolize seed feeders, and nest in natural and man-made cavities around your house and yard. By contrast, Black-throated Sparrows are usually seen alone or in much smaller groups of 2-4 birds, and they nest near the ground, typically in cactus. The easiest way to differentiate the two birds is by color. Black-throated Sparrows are mostly colorless, patterned in shades of black, gray and white, while male House Sparrows are richly colored across their backs in boldly patterned reddish brown. 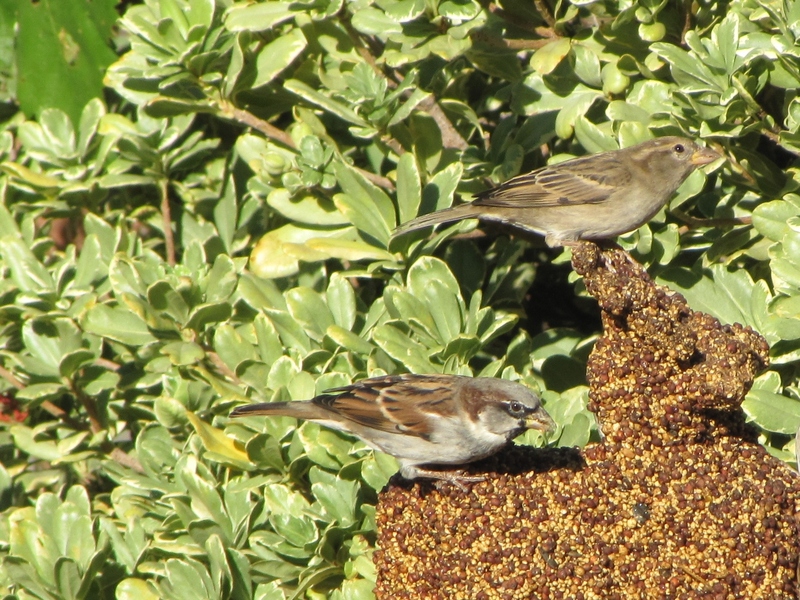 Female House Sparrows are dingy brown with a pale supercilium/eyebrow, and they are found in large numbers with the males. In contrast, male and female Black-throated Sparrows are identically marked, and bold white stripes border the top and bottom of the black stripe that runs through their eye. 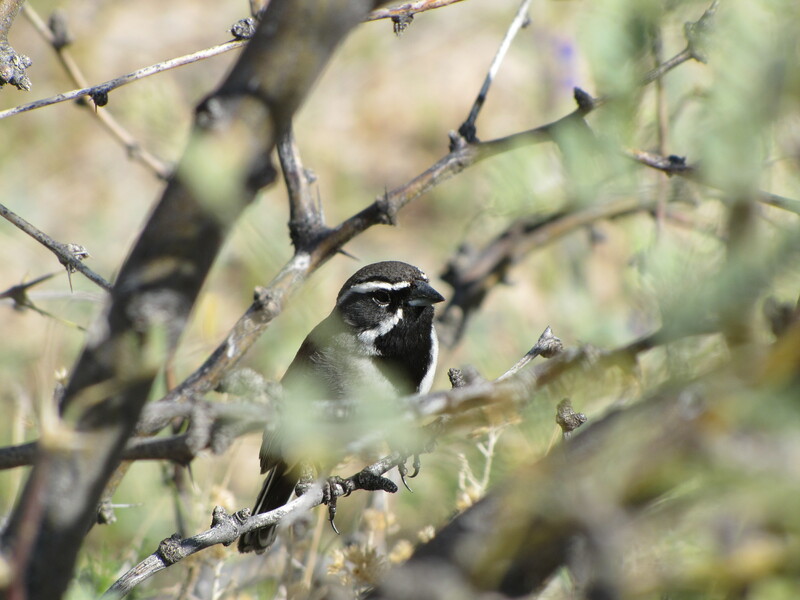 The range of Black-throated Sparrows is limited to western U.S. and Mexican deserts, while House Sparrows are found throughout the lower 48 states, Mexico and most provinces of Canada. This widespread distribution of House Sparrows is all the more remarkable considering that this bird was not present in the U.S. in 1849. In the fall of 1850, 16 birds were imported by the Brooklyn Institute, protected through the winter and then released the next spring. When these birds did not ‘thrive’, the institute purchased and imported more from England (the House Sparrow originally was called the English Sparrow, although it originated in the Middle East.) This second batch of birds was released in 1852 and 1853, and survived and thrived far beyond anyone’s expectations. For reasons that aren’t exactly clear, especially knowing the bird as we do today, more sparrows were obtained in Europe, imported and released in 10 other states, including a whopping thousand birds in Pennsylvania in 1869. From these states, multiplying sparrows were captured and transported to other locations. Coupled with this artificial distribution, the sparrows themselves broadened their range aggressively, up to 150 miles per day. This natural range expansion accounts for Arizona’s House Sparrows, which first showed up in Tucson in 1903. Other countries made similar importations, and today the House Sparrow is the most widely distributed wild bird in the world. Since House Finches are equally widespread in the U.S., and nearly as ubiquitous as House Sparrows, one might suspect they were imported as well, but that’s not the case. 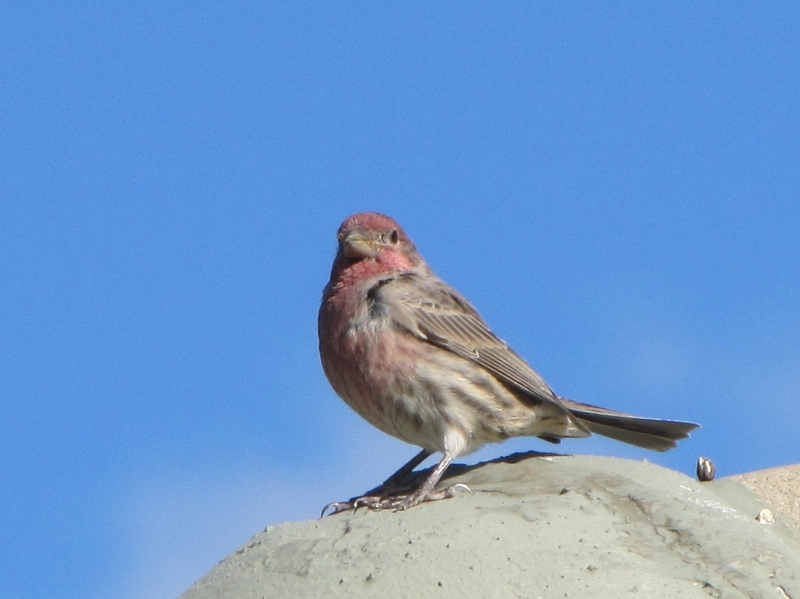 Prior to 1945, House Finches were considered a western bird, ranging from British Columbia to southern Mexico and from California to mid-Texas. In 1940, they were introduced to New York, which for unknown reasons seemed determined to import birds. Those eastern House Finches also expanded their range, which now covers the lower 48 states. Male House Finches are colorful birds, with a bright red forehead, throat, breast and rump. Their feather color is diet dependent, and House Finches in Hawaii, for example, are more orange and yellow than red. Since the finch is a seed and insect eater, this has nothing to do with pineapple. In fact, we occasionally see yellow-colored House Finches here, known as ‘yellow variants’, birds that likely are missing something important in their diet. Be thankful we don’t change color for the same reason. As is the case with many birds, the female House Finch is colorless. ‘Drab and dingy’ apply to female House Finches as well as to female House Sparrows. Don’t feel sorry for the females, though. This is nature’s way of protecting them from predators, and is especially important during nesting. The guys can swagger around with their eye-catching color, but there are times when drawing attention is a bad idea. 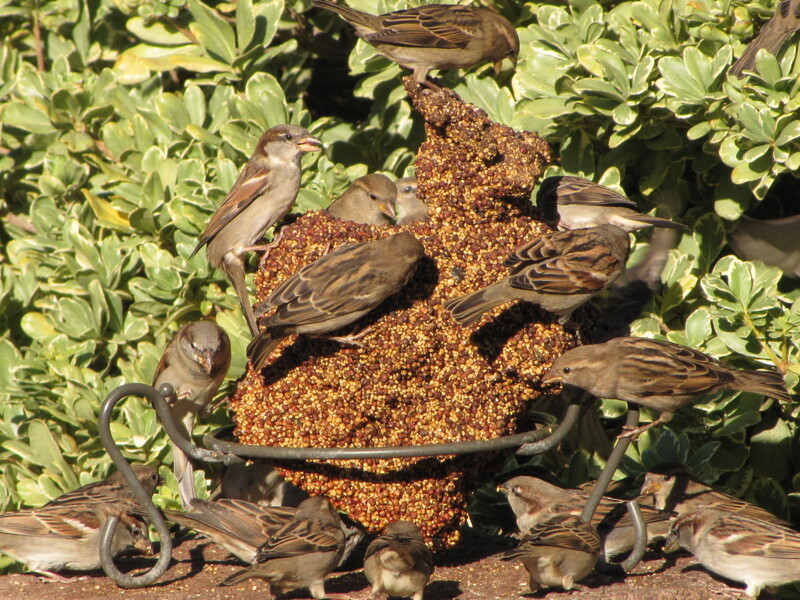 This entry was posted in Birding Arizona and tagged House Finch, house sparrow. Bookmark the permalink.